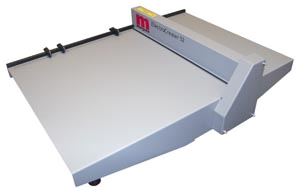 The semi-automatic ElectroCreaser is the ideal unit for printers who need something faster than a manual creaser – such as the Morgana DocuCrease – but do not have the volume of work to justify a fully automated machine like the Morgana AutoCreaser. In contrast, the Morgana ElectroCrease employs a unique creasing rule and matrix as illustrated overleaf, that eliminates tearing and, therefore, cracking. Made in the UK, the ElectroCreaser is ideal for the smaller printer or inplant. A compact, table-top unit, it is fast to set up and simplicity itself to operate. Like other Morgana products, it employs a blade and matrix action which, unlike scoring, will not cause any damage to the substrate, and will produce a superb crease on stocks up to 0.015″ (approx 150lb cover)* including laminated material. Unlike scoring, which can damage card or paper, the Morgana blade and matrix method ensures a clean sharp fold without damage to the substrate. It provides 2 creasing widths as standard, 0.04″ and 0.06″ – with the ability to change from one to another in seconds. It also has a special “Super Speed” stop system, which greatly simplifies jobs that call for multiple creases.